It was not the best of the rounds for the two Kolkata giants as both dropped points while the ever-so-consistent Aizawl FC took full advantage by jumping over to the top of the table with a hard fought victory. East Bengal lost the plot in the first half itself against Churchill Brothers SC when they conceded two first half goals. Kromah and Wolfe were clinical for the Red Machines while East Bengal failed to live up to the expectation. There were reports of some heated chants against Trevor Morgan by the home supporters. On the same day, Aizawl FC were made to sweat in their away tie against a spirited DSK Shivajians side who created lots of chances but failed to convert any. They were later made to regret when Lalmuan Kima scored for Khalid Jamil's side as they leapfrogged East Bengal to the top of the table. Elsewhere in Punjab, where Minerva Punjab FC have showed a tough character hosted a Shillong Lajong FC side who recently broke their away jinx after winning against Chennai City FC(in the Round 10 fixture). Lajong came out on top with Fabio Pena's strike proving to be the winner after Kareem Nurain had cancelled out the lead given by Samuel Lalmuanpuia. Mohun Bagan had a three game advantage while chasing table toppers Aizawl lagging behind by 8 points going into the tie against a depleted Mumbai FC who were seated rock bottom of the league table. With a win on the agenda, Pritam Kotal gave the hosts the perfect start but Mumbai FC retaliated soon after. 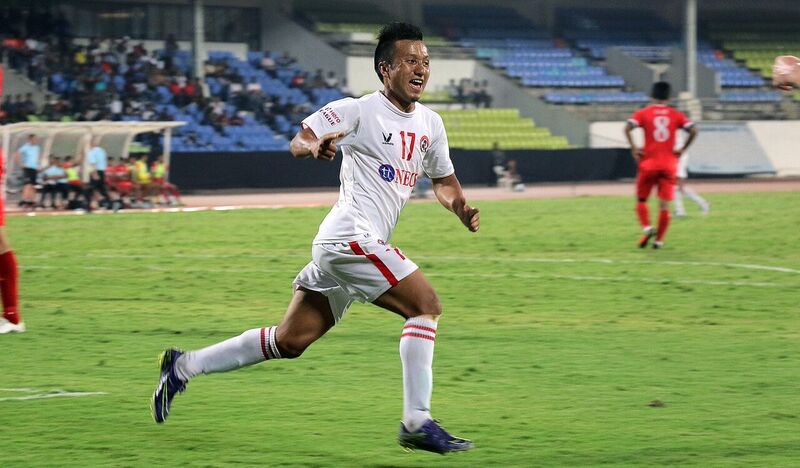 Quickfire goals from Thoi Singh and Victorino changed the complexion of the match as the fans feared the worst. Balwant Singh came to the rescue with a goal at the very depth to give a crucial point for the home side. If Bengaluru FC fans thought that this was a chance to capitalize, then they got the equations all wrong as The Blues were held to a surprise 1-1 draw by Chennai City FC in Chennai. John Johnson's unfortunate own goal was quickly rectified by Daniel Lalhlimpuia who tapped the ball home after Udanta Singh's cross was only palmed to Daniel's path by Karanjit Singh.